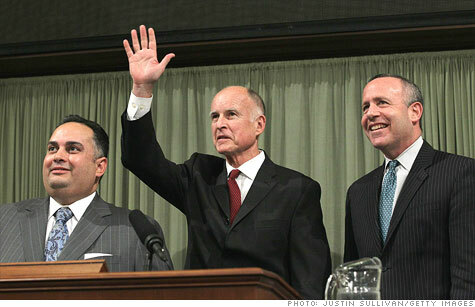 California Governor Jerry Brown and Democratic lawmakers unveil a new budget plan. NEW YORK (CNNMoney) -- Conceding defeat on his tax extension proposal, California Governor Jerry Brown unveiled a budget Monday that imposes deep spending cuts. The plan, cobbled together with Democratic legislative leaders, calls for a total of $14.6 billion in cuts. Much of the bloodletting was agreed to in March, but this week's deal would add at least $2.5 billion in additional reductions. Overall the Department of Health and Human Services would be slashed by $5 billion, while the Department of Corrections and Rehabilitation would see a cut of $1 billion. The state's two university systems would each lose $650 million in funding. The budget hinges on the state bringing in $4 billion in more in tax revenues in the coming year than was initially expected. The improving economy has pushed the state's tax collections billions of dollars above estimates in recent months. Brown expects the windfall to continue into fiscal 2012, which starts Friday. If tax revenue comes in lower than expected, the budget also would impose an additional $2.6 billion in cuts to higher education, corrections and in-home support services for the elderly and disabled. The proposal would slash billions in spending for children, the sick, and the elderly, said Senate President pro Tem Darrell Steinberg. And it would hurt the state's economy, he said. "This budget is the most austere fiscal blueprint California has seen in a generation," Steinberg said. Since the budget does not call for tax increases, it requires only a majority of the Democratic-led legislature to approve it. However, Governor Brown and his fellow Democrats said they plan to put a tax measure on the ballot in November 2012 through a voter initiative -- bypassing the requirement for Republican consent. Though they fended off Brown's tax extensions, Republicans immediately attacked the proposal, saying California needs a budget that will revitalize the economy and create jobs. "This latest budget is based on the hope that $4 billion in new revenues will miraculously materialize, but does absolutely nothing to change government as usual," said Senate Republican Leader Bob Dutton. The proposal is a major shift for Brown, who has said for months that the state's $26 billion budget's gap should be addressed with a mix of spending cuts and tax extensions. He also was determined to fulfill his pledge to put the extension of personal income and sales taxes before the voters. However, he could not convince four Republicans to join him so he could get the measure on the ballot. A budget containing a tax hike needs the support of two-thirds of lawmakers. Republicans have refused to go along unless the budget also contained a spending cap, as well as pension and regulatory reform. The latest proposal was put together less than two weeks after Brown vetoed a budget approved by the legislature, saying it was chock full of gimmicks and contained legally questionable maneuvers. Lawmakers had raced to pass a spending plan by June 15 to meet a voter-imposed deadline that required the legislature to pass a balanced budget or forfeit their pay. However, state controller John Chiang determined that the budget was actually unbalanced. So lawmakers, who earn $95,291 a year and $142 per diem for each day they are in session, have gone without pay since mid-month.